Are you ready for a girls night out? Well if you're not, maybe this little project will get you there! How about a night in Margaritaville? 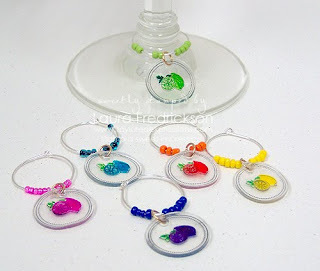 I knew when I saw the little circle from the Berries and Cherries set, it would be the perfect size to shrink for little wine charms, and that is where this little set got it's start. For each charm, I stamped the circle in Stazon Jet Black, then the lime image from Chillax inside the circle on clear shrink plastic. Then I turned the shrink plastic over, and coloured the limes with Sharpie markers, giving myself a little latitude in the colours of citrus fruits. I used the 1 3/4" circle punch to punch them out of the shrink plastic and a 1/4" hole punch to make the hole for the jump ring. I wanted them all to be fun bright colours, and easily identifyable so no one could lose their drink! The rings are earring hoops and the coordinating beads are from my vast stash. I had in mind a fun ensemble, something to really get a party started, and since we'll all be drinking margaritas, a little salt (and lime!) was in order. 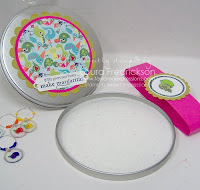 I had an tin that h ad once held a stamp set, but I took the stamps out since I couldn't see them through the tin. I created a label with nestabilities and a belly band to tie it all together. I used the same images as in the charms, and coloured it with Copics. I added some stickles around the edge and on the cut lime slice. 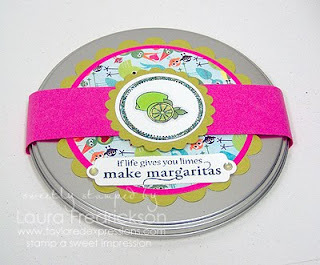 Inside is the salt for the rim of the margarita glass, and being a circle tin, it's just perfect for the job! 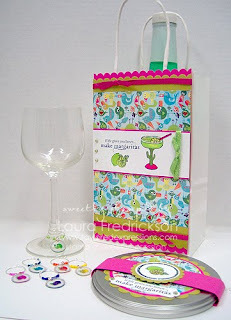 Finally I finished up with a little gift bag that makes this kind of a party in a bag ensemble! I covered the bag with Pink Passion and Kiwi Kiss cardstock, adding some designer paper from Basic Grey's "Lime Rickey" paper. Those little birds remind me of the little bobbing birds that used to be a popular decoration when I was younger. You don't see them much now, but I was fascinated by them as a kid! 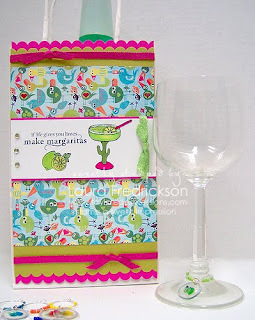 I stamped the margarita sentiment and images from Chillax in Memento Tuxedo Black and coloured them with Copic markers. Again, I added some stickles to the cut lime and along the edge of the margarita glass. The ribbon is the gorgeous Glimmer Twill from Taylored Expressions, and I added a few gems to finish it off! Now how fun is that? I love these sets and the possibilities for projects is endless! I hope you have one in mind right now as we head toward the weekend! Make sure you take the time to Chillax and enjoy the last days of summer! wowee, Laura! this is FANTASTIC~totally love the idea & your execution of it, down to the salt tin!! This is such a great set! Wonderful job! OOOH! LOVE this Laura! I am SO ready for a girls night out!! These are simply FABU!!! Awesome project...I'm especially LOVIN' the charms! !